Hybrid SUV Review: When you think of hybrids, you probably imagine dorky little wedge-shaped cars that look like they belong in a bad science fiction movie. But not all hybrids are like that. This week I drove a hybrid that can tow 6,200 pounds with a massive, 6.0-liter V8 engine. And, oh yeah, it's a huge SUV. The Chevy Tahoe Hybrid doesn't look like your typical gas-electric hybrid vehicle. Electric motors and a bank of batteries boost the fuel economy by 50 percent. Inside, the Tahoe Hybrid has the same spacious cabin as the regular Tahoe, with the exception of a few "Hybrid" logos and extra gauges. It's the Chevy Tahoe Hybrid, and it's turning everything you think about hybrids, and SUVs for that matter, on its head. It's proof that hybrid technology isn't just about nerdy economy cars and massive SUVs aren't necessarily gas guzzlers. Like all gas-electric hybrids, the Tahoe Hybrid uses a bank of batteries and electric motors to boost power so it doesn't use so much fuel. Every time you press the brake pedal, the batteries are recharged, so you don't have to plug it into an electrical outlet. But that's where the similarities stop. Unlike, say, the Toyota Prius, which is designed almost purely for fuel-efficient driving, the big Tahoe is designed first and foremost for good performance. The hybrid system just means you get far better gas mileage while doing it. 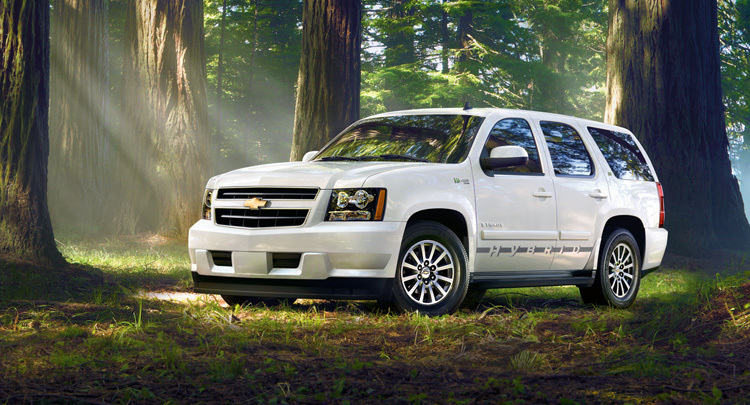 The 2-wheel-drive Tahoe Hybrid gets 22 mpg on the highway. That might not sound too impressive when you compare it to the jaw-dropping mileage numbers on cars like the Prius, but think of it this way: that's 50-percent better mileage than you get with a non-hybrid Tahoe. That's downright amazing considering the Tahoe is a brutal, V8-powered, full-size SUV. In a lot of ways, the Tahoe Hybrid drives exactly like the normal Tahoe. Stomp on the gas pedal, and it rockets forward with the same kick-in-the-pants grunt of any powerful truck. But you'll notice some differences, too. There's a soft, high-pitched whine when you press the brakes, presumably from the system that recharges the batteries when you stop. It sounds like a miniature jet engine under the car. Chevy made some minor changes to improve the Tahoe's aerodynamics and reduce weight. The front air dam is lower and smoother, without openings for fog lights or tow hooks. There are subtle but important aerodynamic changes around the wheel wells, tapered running boards, and a smoother rear fascia. It also has some different gauges that show when it's driving most efficiently and some fairly big "Hybrid" logos on the body to show everyone that you're really not driving something that's killing all the penguins. But beyond those minor differences, the Tahoe Hybrid is essentially just another Tahoe. It's roomy, quiet and comfortable, with the high vantage point and beefy, solid feeling you'd expect. Pricing starts at $50,455 for the rear-wheel drive model, or $53,260 for the 4x4. That's a lot of money, but it also includes a long list of high-end features at no extra charge. What was tested? The 2009 Chevy Tahoe 4WD Hybrid with a base price of $53,260. Options on test car: Rear seat entertainment system $1,295, power sliding sunroof $995. Total MSRP price as tested including the $950 destination charge: $56,500. Why avoid it? It's expensive and, while it's far better than a normal Tahoe, it still only gets 22 mpg on the highway. Why buy it? It has the Tahoe's legendary size and grunt and it gets 50 percent better fuel economy thanks to hybrid technology. Bottom Line: The Tahoe Hybrid comes from the factory with a navigation system, tri-zone automatic air conditioning, a rear-view video camera, Bluetooth connection for your phone, and satellite radio. And the greatest luxury of all? The gas receipt you get every time you fill up at the pump.